In 2008, Kevin Matthews, a well-known ABC and CBS radio personality in Chicago, was diagnosed with multiple sclerosis. As the drive-time radio host for seventeen years on AM 1000 The Loop and ABC and CBS radio, and also the voice of his sports commentator, Jim Shorts, and other characters, Matthews entertained ten million listeners weekly, sold out every appearance in the Midwest, and performed in front of 65,000 fans at Grant Park. He traveled around the world, met the famous, had babies named after him, and helped countless charities. He entertained hundreds of thousands of people inside prisons, army bases, and backyards. His promotions included comedy jams, a band, barbeque throw downs, and golf outings. 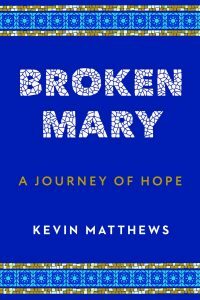 Broken Mary is Matthews’ story of his early years in radio and stand-up comedy, his successful career, his struggle with MS, his awakening to the dignity of women, and, importantly, his chance encounter with a broken statue of Mary left next to a dumpster and all that happened as a result. Told with Matthews’ signature good humor, this confession of the brokenness of mankind is touchingly honest, personally inspiring, and full of hope.